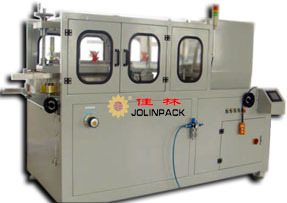 Precision designed and engineered by expertise .This carton erector has been awarded several patents ,and has received approval from famous industries around the world .It is the highest speed carton forming and sealing machine in Dalian Jolinpack. Fully cams are driven continuous system assures positive stable motion with maximum stability. In a breakthrough for tapping head design ,this machine provides extremely secure sealing effect ,outstanding tape smoothening performance ,without tape slipping problems. Accommodates all type of self-adhesive tapes. Variable speed adjustment for carton forming and sealing . Reducing labor requirements. Easy to operate and adjust .No damage on carton. Horizontal cardboard stacking permits for supply of empty carboard at any time. Automatic indication for tape replacement or cardboard supply. 1 1/2" ,2" 2/12" , 3"